I’ve been a bit rubbish at blogging this week I am afraid. I’ve just not got round to it in the evenings. This was the first week that I cycled more than 100 miles. I lost over 5 lb and the bike has now done 723 miles. On Tuesday and Wednesday I cycled home a different way, along the Norhtern Line. There definitely less steep hills and in that respect it was probably a bit easier. There were however more traffic lights and a few narrow bits that got really snarled up with traffic that made it difficult to get past. The rest of the week I went my usual way back cutting across Clapham Common and I think that I will continue to use this route. On Tuesday Morning I got held up a little on Tower Bridge. For the second time I saw the bridge raise in front of me but this time it wasn’t a tiny little sailing boat but a very big cruise liner. More pictures here. 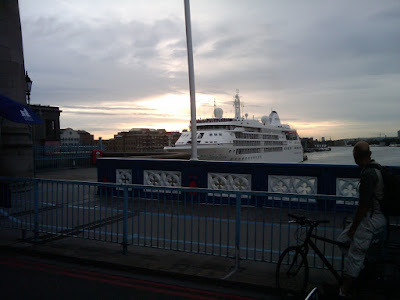 She was still moored between Tower Bridge and London Bridge when I went past in the evening but had left the next morning. I should think she left on the early morning high tide. On Wednesday morning I had a fantastic ride in and did the whole journey in less that 50 minutes averaging over 15 MPH over the 12.5 miles. There is much less traffic in the morning so the Northern Line route works well. Thursday and Friday were VERY windy on the way home which makes life a lot harder. My journey home on Friday was particularly annoying as I had a slow puncture. I filled the tyre up at Evans Canary Wharf and again at Evans Clapham. At Clapham I could actually hear the air escaping so I had to stop again on my way home to top it up from my hand pump.